Comeonyouwarriors.co.uk - "Inn at the Side"
There were 47 suggestions entered with a wide variety of references to Rugby, The Warriors, Worcester and the history of Rugby in Worcester. The Committee members each chose their three favourite names with the winner being the one that occurred the most. As it happens all of the Committee members had the name "Inn At The Side" as one of their choices. Unanimous decision! The winning suggestion was sent in by John Guest ! Congratulations John ! The club readily accepted the name and the signage was designed and costed and then generously sponsored by The Crown Inn St Johns owner Rob Turner. Many thanks to Rob as he also sponsors the WRSC Player of the Match by supplying the tankards presented to the players. Edited 1 time(s). Last edit at 2018:11:16:10:47:53 by Powick Eastander. 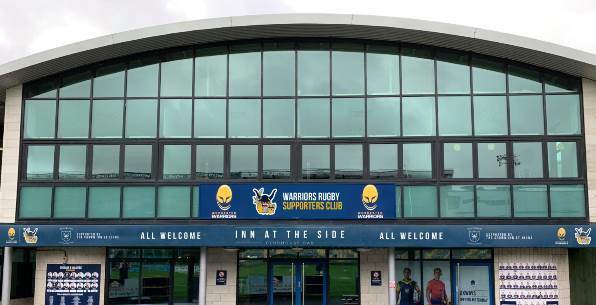 Re: "Inn at the Side"
Well done to all involved, particularly Warriors for giving the Supporters' Club such a prominent home. No Wednesday Team Prediction this week but hints for the next week?